WASHINGTON—Leaning in close behind the first lady and softly whispering into her ear, President Obama gently guided Michelle’s hand as she maneuvered a Predator drone joystick control to acquire a high-value overseas target, White House sources confirmed Friday. 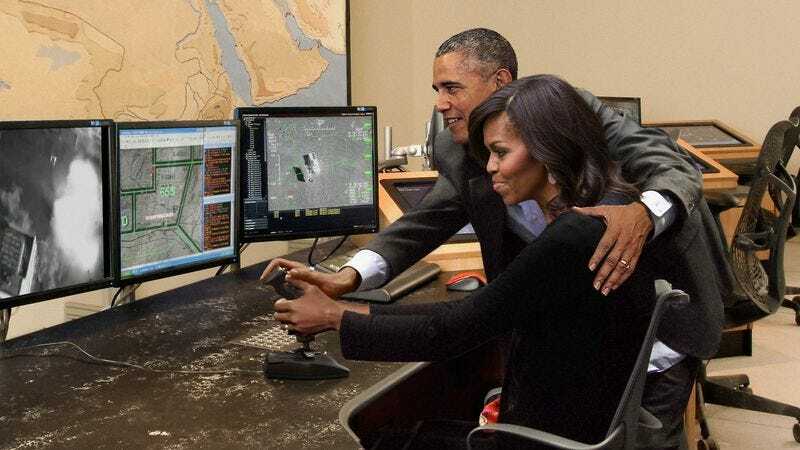 “Now keep your eyes on the digital-terrain data feed on this monitor as you slowly pull up on the stick—wow, you’re such a natural at this,” said the commander-in-chief as he tenderly led his wife’s hand to the laser designator. “Careful now, not too steep! That’s it—steady, steady. Whenever you’re ready, just aim at your target and discharge the Hellfire missiles.” At press time, sources confirmed that the president and first lady could be seen locking eyes intensely and smiling after they pressed the unmanned aerial vehicle’s launch button in unison.